What a incredibly lazy Saturday I've had! I didnt get out of my PJ's till gone 1pm! Judging by the ammount of retweets I had on that tweet I wasnt the only one! Comfort over style, although I quite like this outfit! I adore these New Look hoodies, They are really similar to the American Apparel ones but super cheap. This grey marl one is my fave to snuggle down in! I didn't really need this dress when I bought it, I have been cutting down on the amount of clothes I've been buying recently. However of course I justified it to myself saying its black and white stripes rather than the typical blue and white you get. Lame excuse, Ha! Fox hat purely for the lolz! I love wearing it! River Island is my favourite shop at the moment, I think their autumn winter collections are always spot on. I placed a sly order for quite a few things this week which I cant wait to come! Hopefully they'll be on the blog soon! P.S For the beady eyed ones, yes I'm missing a nail on my right hand (your left!) popped off when I was photographing without me realising! 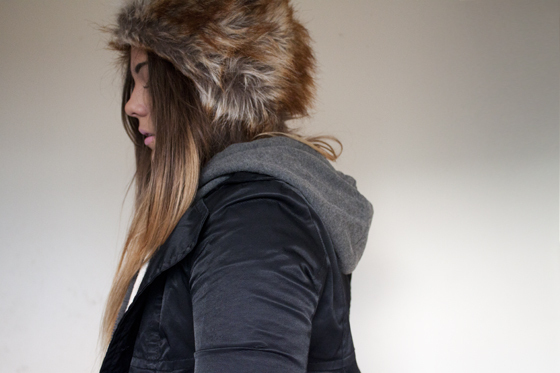 My friend has that hat and it looks so soft and cosy! might get myself one of those hoodies! i refuse to pay all that money for an AA one! haha, the first picture is so cute <333 love the fur hat, it looks good on you! love the hat! my friend has it and wears it constantly! got a giveaway on my blog! Considered getting that New Look dress but didn't give in but you've definitely just changed my mind! The hat is adorable, wish I could pull it off as well as you do haha. hmm I have been eyeing up those style of hoodies just trying to find somewhere cheap! luv these photos, I love the dress too i need a stripy dress in my wardrobe! Cool to see you in something more casual Lily! Not sure if I'd be brave enough to wear it out but the hat IS AWESOME! i want a cosy hoody! oh em gee that hat is super cute! i've been after this hat for a little while now, looks lovely on you :) River Island really is doing such a good job at the moment! That hat is an absolute must. YOU LOOK SO FREAKING ADORABLE IN IT!! I love the hood! I love your various faial expressions! I need this hoodie in my life. I love the first photo, made me laugh - only yo u could make the fox hat work! This hat is so cute! Not sure if I could pull it off but looks darling on you. You were on about this dress before I think and it's now £25!! aha that hat is amazing. i want it! How Adorable!! Lovin the hoodie under the leather:) And i know what you mean, i didn't get out of bed until 12 today! Have been wanting to buy this hat for the longest time but didn't have the guts to wear it... I may just go get it now! 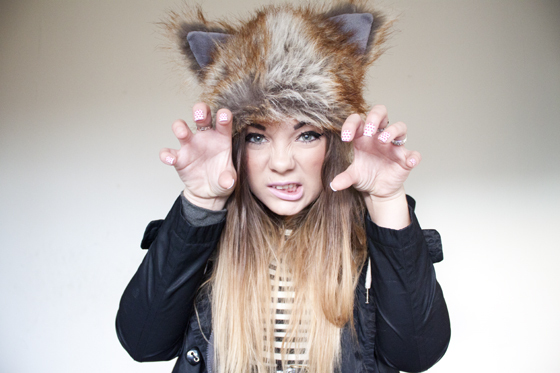 Love the foxy hat! So cute. I tried that hat on the other week. Then I caught sight of how idiotic I looked in a mirror and quickly ripped it off before anyone saw. I hate trying on hats when shopping alone. ah lily you look soo cute!! 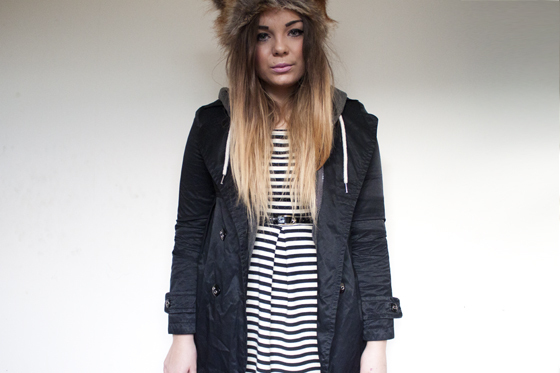 i love this outfit, its something i would deffo wear! You're so ridulously hot! Love the hat! Aw I love that hat, I want one! Another lovely outfit! 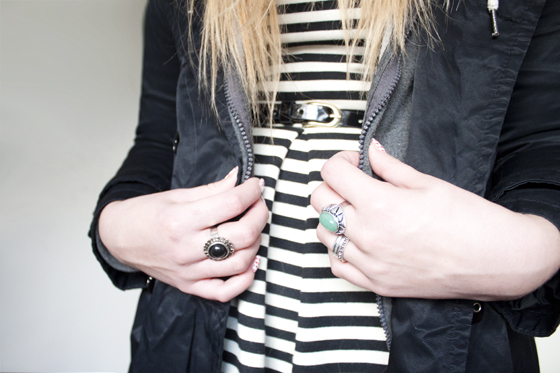 I love how you stick to classic combinations, such as black and white, without over-complicating it. And the hat is mega cute and warm-looking! Awh soo cute! I want one! nawwww. fox hat is super cute! !